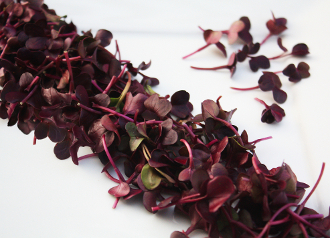 Micro Radish Ruby™ is truly an eye-catcher, with its royal dark purple leaves on matching purple colored stems. It's fresh and spicy radish flavor accents seafood and meat entrees. Contains antioxidants, that create its brilliant color. Show its colorful personality in mixed green salads, soups and sushi!